Hi, Tatertots and Jello readers! I’m Chelsea from Two Twenty One, where I blog about a wonderful array of topics– DIY projects, home & holiday decor, organization, recipes, lifestyle, and more. Jen’s blog is one of my favorites so I’m happy to be here! Today I’m sharing a bright and cheerful Christmas wreath with you. 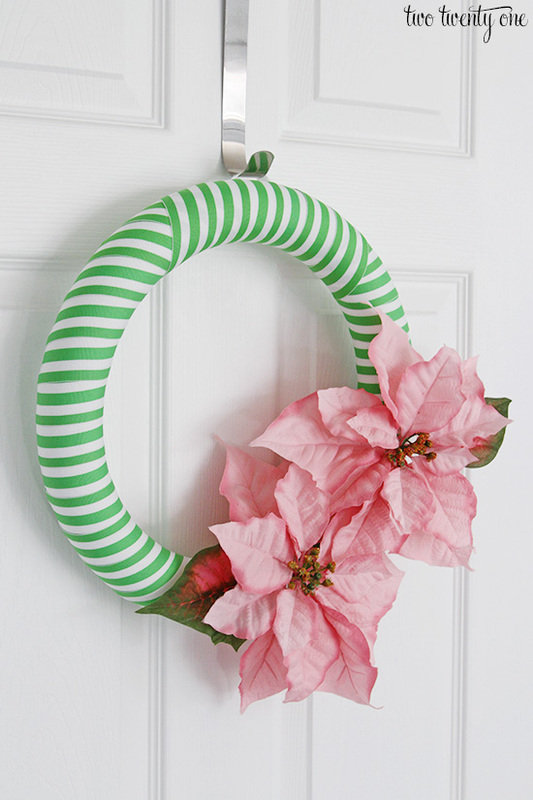 It’s actually a wreath I made this spring, but instead of making a whole new wreath, I removed the pink peonies I used on the original wreath and replaced them with pink poinsettias. Why not get more use out of something you already created? But don’t worry, I’ll explain how I made the wreath. I originally tried wrapping the ribbon without cutting it but I couldn’t get it to look how I wanted so I went with a strip method. 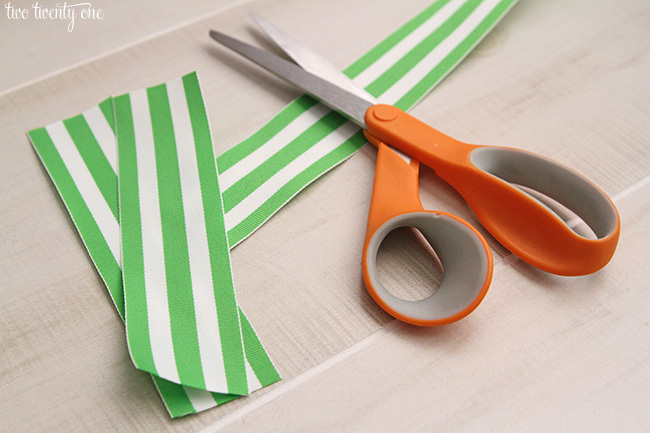 Begin by cutting some strips of ribbon. I used 6 inch and 8 inch pieces of ribbon. So don’t cut all your ribbon at once. Wait and see what length you’ll need as you work your way around the wreath form. Then, start wrapping each piece around the wreath and gluing it into place. 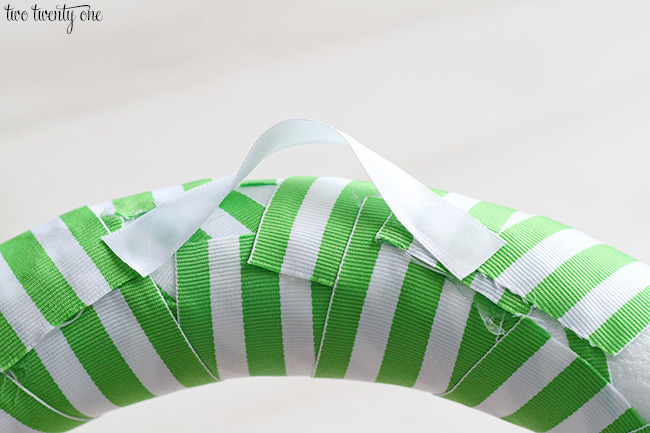 Overlap the green stripes on the edges so the stripe pattern lines up. Because it’s kind of tricky getting everything to line up, try to be patient and play around with the ribbon a little bit. 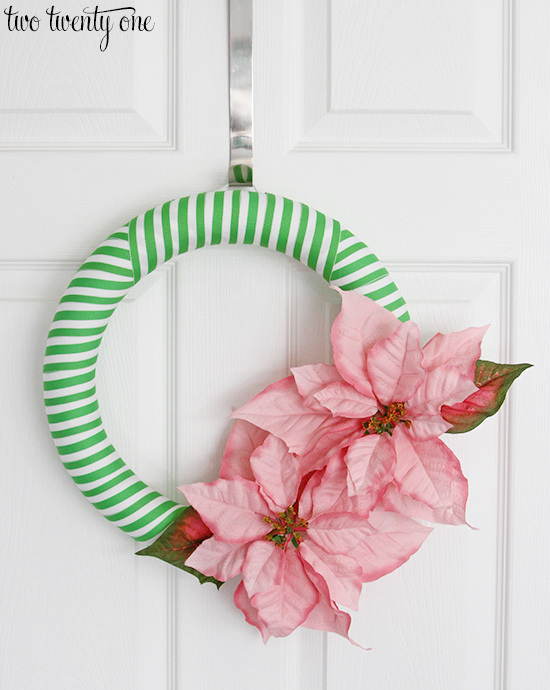 To attach the poinsettias, pull them off of the stems, cut the little plastic parts off, and hot glued them onto the wreath. For the hanger part, I wanted to do something that would be mostly hidden and wouldn’t take away from the wreath so I grabbed a little piece of white satin ribbon. I hot glued it onto the back of the wreath. As you can see, the back of the wreath isn’t pretty, but no one will see that anyway. I always like to share the cost of my projects with my readers, so here’s the price breakdown. Feel free to stop by Two Twenty One anytime! Happy holidays! Her Bright and Colorful Nursery reveal is so gorgeous. I love all the different patterns she used! She also has this super cute idea for Tiered Tomato Cage Christmas Trees! So clever and cute. Make sure you grab her super Free Christmas Gift Tags too! I am so in love with this Christmas wreath! 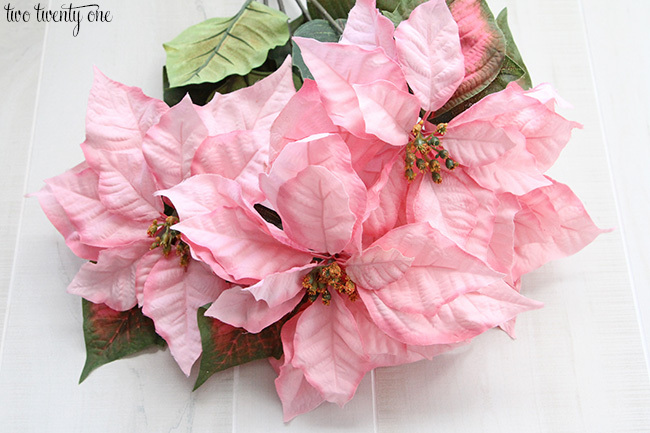 Pink, stripes, poinsettias, what’s not to love? It’s awesome!